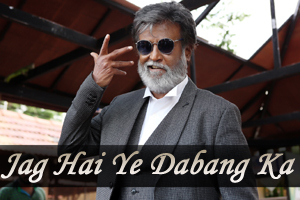 A pop song sung by Shankar Mahadevan and Rohit Fernandes featuring Rajinikanth. The video of this song is available on YouTube at the official channel Think Music India. This video is of 4 minutes 03 seconds duration. Lyrics of "Jag Hai Ye Dabang Ka"
Lyrics in Hindi (Unicode) of "जग है ये दबंग का"